Lea Gardens, which have been established for 45 years, contain a unique collection of highly acclaimed rhododendrons, azaleas kalmias and other plants collected from the far corners of the world. 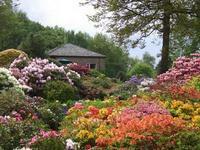 The nursery specialises in hardy, outdoor rhododendrons, azaleas and kalmias, and can advise on planting schemes. The Gardens are sited on the remains of a medieval millstone quarry and cover an area of approximately 4 acres (1.6ha) on a wooded hillside. The excellent rock Gardens contain a huge variety of alpines with acers, dwarf conifers, heathers and spring bulbs. Bird life has been encouraged in quiet woodland walks below the main gardens. This area, planted with ornamental trees and specie rhododendrons, contains many assorted bird-boxes donated by friends of Lea Gardens. The colours, scents and natural bird life can best be appreciated on a quiet weekday. 3 miles to the South of Matlock. 45 minutes from Derby, Nottingham Buxton or Sheffield. Leave A6 at Cromford, signposted to Lea or leave the A615 between Tansley and Wessington again signposted to Lea.